This is the second post in a two-part series on fever in children. Last week Dr. Cara Barone provided excellent information regarding why children get fevers, how to measure your child’s temperature, and whether to worry or discuss with your physician. This week I’m back to review when and how to treat fever in kids. Once you’ve determined that your child has a fever, consider whether it needs treatment. It may surprise some parents to know that fever does not necessarily require medication. If your school-aged child has a mild temperature elevation (99-101F), but is alert and playful, drinking fluids well, and does not appear distressed, opting not to treat is a very reasonable approach. If your child has a higher fever and is feeling miserable, it may warrant treatment. In addition to considering fever-reducing medicines, it is appropriate to start by providing your child with supportive measures at home. These may include a cool, wet cloth to the forehead, unbundling your baby or taking off a layer of clothing, and providing lots of hydrating fluids and TLC. A trip down the aisle of fever-reducing medicines (also called anti-pyretics) at your local pharmacy can be enough to make your head spin. Multiple formulations, multiple brands- it can all be fairly confusing. I hope this guide will make it easier to navigate. Before choosing which medication to use, here are a few general principles. Note the concentration of the medicine you are using. You’ll find the concentration on the label. Liquid medicines for kids are most often marked in milligrams per milliliter (mg/mL). Use only the dose suggested for that formulation or you may end up giving an incorrect dose. Measure the dose carefully (based on your child’s weight and age) using a numbered syringe. Using a common teaspoon or estimating is an inaccurate way to dose medicines. Fever-reducers can be helpful in the correct dose, but they have a sweet-spot. Give too much and your child may experience side effects. Give too little and they are less likely to be effective. These medications take 20-30 minutes to start working and have a duration of 4-6 hours. Remember that while they can be helpful to alleviate symptoms, they are not a “cure”. Don’t be surprised if the fever returns after they wear off. I do not recommend taking an “around-the-clock” approach to giving medication for fever. Prior to giving a second dose, determine whether your child’s fever is returning, measure the temperature, and decide whether they actually need more medicine. Finally, remember that the medications reviewed below help alleviate fever or pain. 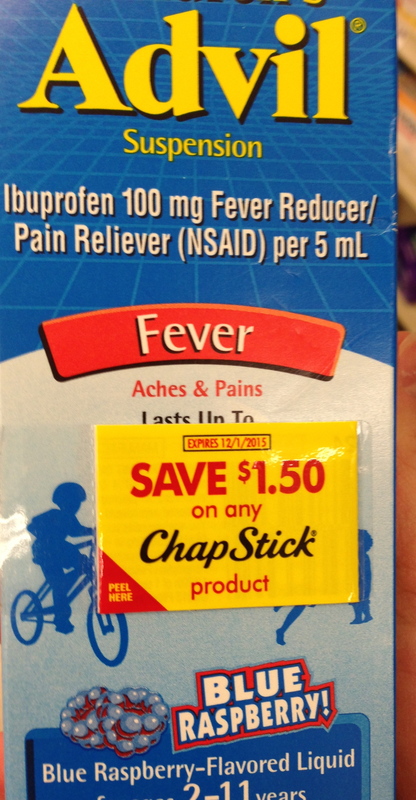 They do not work for cold symptoms (i.e. cough and runny nose) and should not be given for those symptoms. All of the following contain the same active ingredient, acetaminophen. They should not be given at the same time. 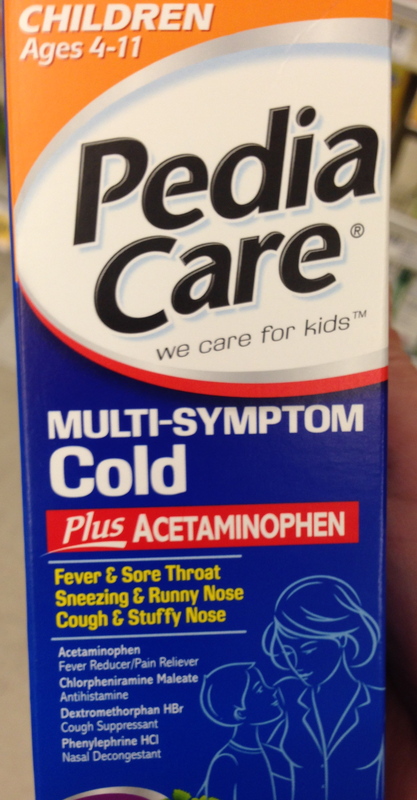 The most commonly used of the fever-reducing medicines, many parents have reached for a bottle of acetaminophen at some point. The liquid marketed to children comes in the concentration of 160mg/5ml. The infant drops have been discontinued due to potential for confusion in dosing. Like most medicines for children, acetaminophen is dosed by weight and can be given up to every 4-6 hours. It is important to give an accurate dose and not to exceed the recommended dosing quantity or interval, as acetaminophen can be damaging to the liver in inappropriately high doses. If given in the appropriate dose it can be given as young as the infant age group. All of the following contain the same active ingredient, ibuprofen, and should not be given at the same time. Ibuprofen is generally thought to be safe to give to children older than 6 months of age. The common suspension is 100 mg/5ml, although there is also an infant formulation (50mg/1.25ml) so this is a case where it is important to make sure you are dosing correctly for the formulation you are using (see below). Ibuprofen is dosed by weight and can be given up to every 6-8 hours. Notice the difference in timing of acetaminophen and ibuprofen. Acetaminophen can be given up to every 4 hours, but ibuprofen should not be given more frequently than every 6 hours. This is one reason I am generally not in favor of alternating ibuprofen and acetaminophen during the same illness in the same child. It leads to confusion in dosing. Pick one medicine that seems to work well for your child (and is palatable) and stick with it. Despite similar appearance, these two versions of Advil (ibuprofen) are different concentrations and should be dosed accordingly. Aspirin is not recommended for use in children. 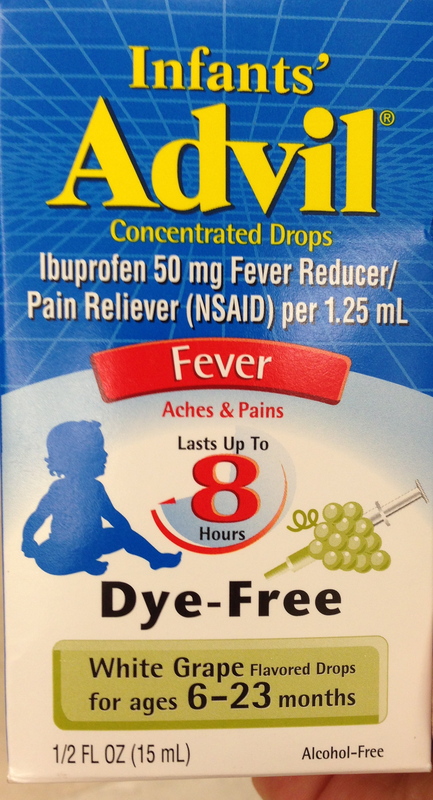 Be careful when choosing a fever-reducing medicine for a young child that you do not choose one of the various “combination” medications available over-the-counter (see below). These medications typically have acetaminophen, but they also contain ingredients that may not be appropriate for your child’s age or symptoms. These cough and cold preparations are no longer recommended for children under 4 years old for two reasons: (1) they are not very effective at reducing symptoms and (2) they have unacceptably high risk of side effects. This medication has acetaminophen, but also has other ingredients. It should not be given to children under 4 years old. If you have any doubts or questions regarding your child’s fever or how to treat it, it is best to get in touch with your child’s health care provider. Here again are Dr. Barone’s excellent guidelines for when to call your child’s physician. **Disclosure: I have no financial relationship to any of the products pictured in this post. They are simply provided as examples of available products. This entry was posted in General Pediatrics, Health, Questions from Clinic and tagged acetaminophen, advil, fever, ibuprofen, motrin, pediacare, tylenol by My Two Hats. Bookmark the permalink. 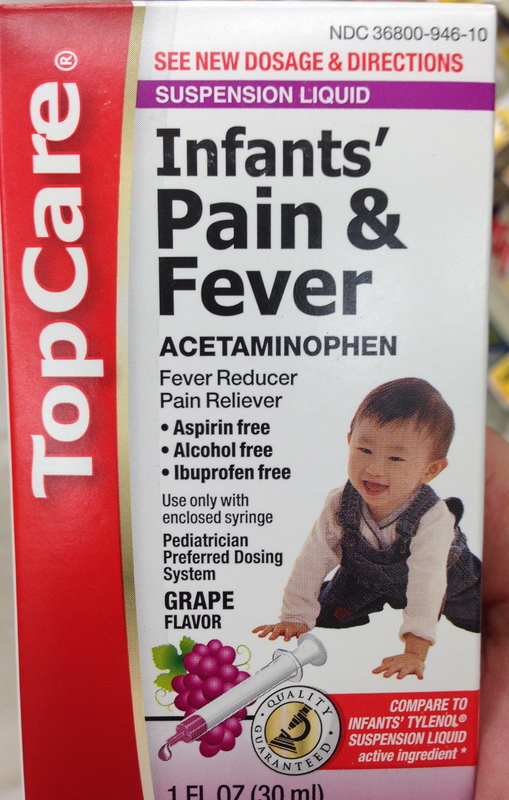 I have been slightly freaked out about fever reducers/pain relievers since hearing the This American Life episode on acetaminophen and its potential to damage the liver when more than the maximum dose is taken. Thanks so much for this clear and thorough information. The first prospective cohort study has been published to look at children exposed to long-term use of acetaminophen during pregnancy and has found they had substantial adverse developmental outcomes at 3 years of age. These developmental outcomes are typical autism phenotypes. Exposure to acetaminophen for more than 28 days in pregnancy increases risk of psychomotor and behavioral outcomes by almost 70% and doubles the risk of language problems. No association of adverse neurodevelopment was found with ibuprofen suggesting a specific effect of acetaminophen that is less likely to be confounded by indication.